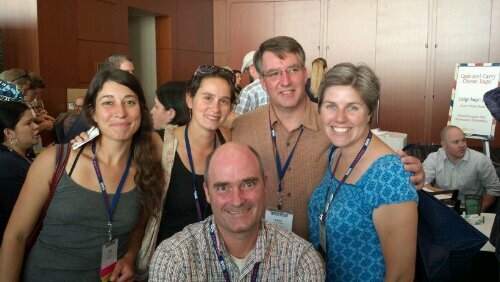 The Maine Guildsters just before they enter the last event of this year’s ACS Conference. 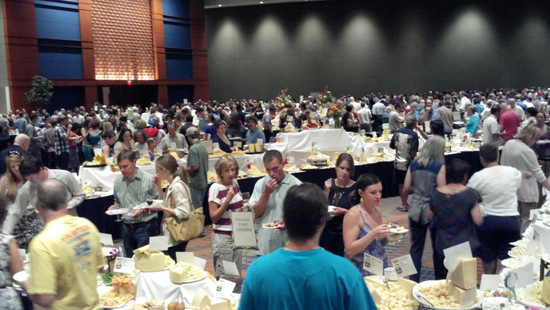 This year’s Festival of Cheese was more awesome than ever, and the best part was that there were hundreds fewer items to taste than there could be. For the first time this year all of the more liquid entries (yogurts, sour creams, ricottas, kefirs, butters, mascarpone, creme fraiche, etc. ) were offered at breakfast instead at the Festival where they were almost universally ignored. At breakfast this morning (complete with the ribbons for award winners) they were treasured and sampled and worshipped and honored. I had a little of each type and expecially enjoyed the Vermont Butter & Cheese Creme Fraiche on top of a cracker that had nuts and raisins. 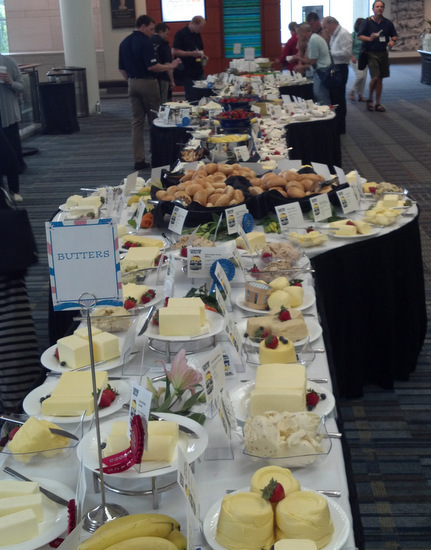 So instead of the 1711 competition entries greeting us as we walked into the ball room tonight there were probably only about 1500 or so cheeses for us to try. No matter, it was a sprint for me to get pictures of each of the Maine award winners, and then to tables straining with the weight of our favorite types (naturally I went to the Blue table). 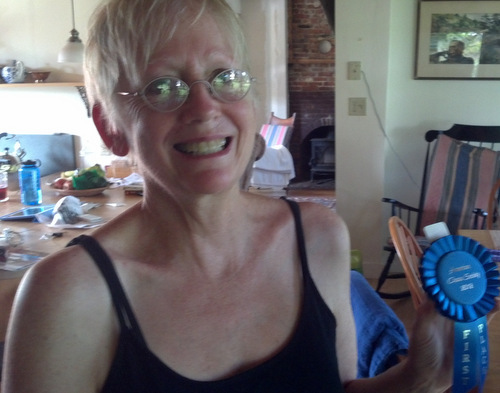 Jamien Shields with her 3rd place ribbon winning Turner Farm Creamery cheese called Whitecap. 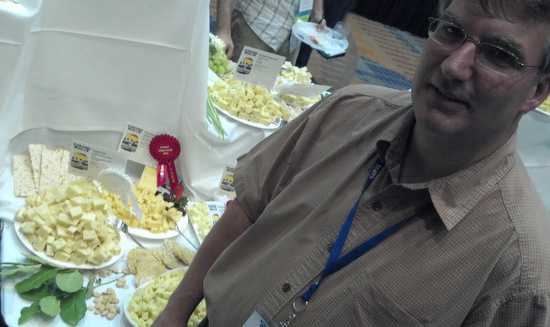 Kevin Burnsteel beside his 3rd place ribbon winning Pineland Farm Creamery cheese called Salsa Jack. 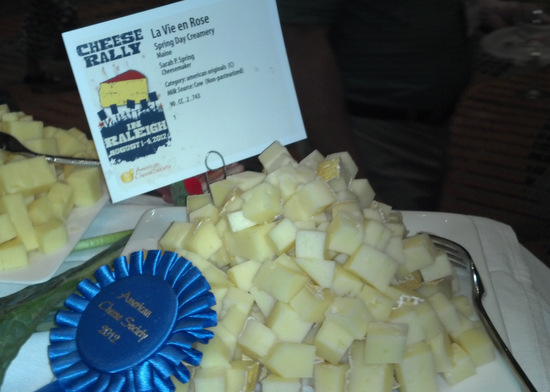 Sarah Spring’s 1st place ribbon winning La Vie En Rose cheese was prominently placed at the top of the table for American Originals, just below the Best of Show winner Flagsheep from Beecher’s Handmade Cheese. As usual the members were let in half an hour before the public was, and the Guildsters were at the front of that line. 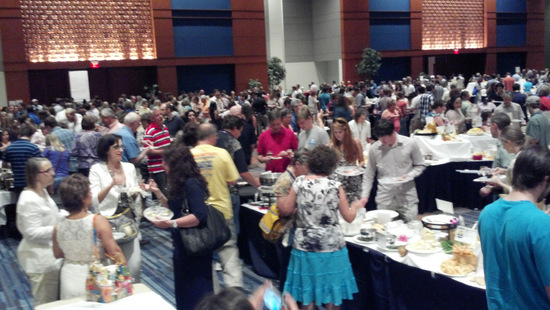 Even so the hall was filled with Cheese-sters by the time that the public was let in and made the single layer of tasters surrounding each table into three layers or more of people flavor surfing. 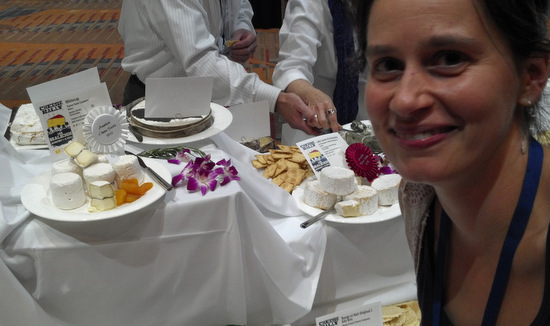 Some of the notable cheeses I tasted (besides those of my fellow Guildsters) were Blue De La Moutonnière, Roth Grand Cru Surchoix, Marike Gouda Cumin, Carr Valley Cheese 6 Year Cheddar, TeaHive Cheddar, Vermont Butter & Cheese Creamery Goat Feta, Goat Lady Dairy Smoked Round, and after almost two hours of cheese cheese cheese cheese crackers cheese cheese cheese cheeese cheese salami beer cheese cheese and cheese I was suddenly gobsmacked with a cheese I’ve eaten maybe twenty times before: Red Hawk from Cowgirl Creamery was like a beacon in the murk projecting a crazy cream dream in my mouth like the sun through your eyelids at the beach. It was so so good, like the entire conference, and a great note to end the week on. 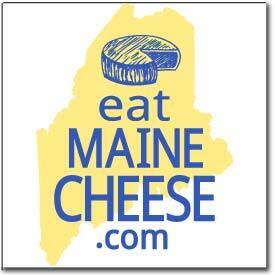 Posted in Guild, News and tagged ACS, Festival of Cheese.